The first 450SX Class race held in St. Louis was on April 27, 1996. Jeff Emig won on a Kawasaki, breaking Jeremy McGrath''s 13 450SX Class race win streak. This will be the 20th time the gate will drop for a 450SX Class race in St. Louis. Ricky Carmichael won his final 450SX class race in St. Louis in 2007. There has never been a first-time 450SX Class winner in St. Louis. Carmichael and Chad Reed are tied for the most 450SX Class wins in St. Louis with four each. James Stewart and McGrath both have three. Carmichael won St. Louis on three different brands: Kawasaki, Honda, and twice on a Suzuki. Reed can join him because he has won St. Louis on a Yamaha and Suzuki already. McGrath won the ''97 450SX Class race in St. Louis on a Suzuki. It was the second of only two-career 450SX Class victories he earned on a Suzuki. Kevin Windham is the only other rider to have multiple 450SX Class wins in St. Louis with two. Windham''s two 450SX Class wins in St. Louis were ten years apart. In ''98, he won his first St. Louis Main Event and ''08 was his second one. He is also the last 450SX Class rider to win St. Louis on a Honda (''08). Emig, Ryan Villopoto, and Ryan Dungey all have a single 450SX Class win in St. Louis. Dungey could become the first 450SX Class rider to win St. Louis on a KTM. There have been four riders to win St. Louis in both the 250SX and 450SX Classes: Windham, Carmichael, Reed, and Stewart. Davi Millsaps could join this group with a victory, as they have all won the St. Louis 250SX Class previously. Only twice in the past nine seasons has the winner of the 450SX Class race in St. Louis went on to win the 450SX Class Championship. Eli Tomac earned his second career 450SX Class victory with his win in Detroit. The race was his 25th career 450SX Class start and eighth career 450SX Class podium. Tomac was by far the fastest rider on the track in Detroit. Will he be the fastest rider in St. Louis? You can bet he thinks so. Dungey earned his 11th straight podium with a second place finish. He has finished inside the top-two nine times this season. Dungey made his 95th career 450SX Class start in Detroit. He now has 68 career 250SX Class podiums. Dungey continues his consistent pace up-front as the Championship Standings leader. Look for him on the box the rest of the way, as he hasn''t finished off the box since the opening race of the season. With his third place finish in Detroit, Cole Seely now has back-to-back 450SX Class podiums for the first-time in his career. It was his 23rd career 450SX Class start and fourth career 450SX Class podium. Seely has quietly earned three podiums in the past four races. Is he finally going to breakthrough for the 450SX Class rookies and earn a victory? Making his 182nd career 450SX Class start, Reed earned his fifth top-five finish of the season. It was his 149th career 450SX Class top-five finish. Millsaps finished fifth in Detroit. It was his second consecutive top-five finish and that is the first time he has done this since the last two races of ''13. It was his 56th career 450SX Class top-five finish. For the second straight week, Millsaps looked really fast. Is he due for a podium or a win? Josh Grant tied his season''s best sixth place finish in Detroit. He now has five top-10 finishes on the season. Broc Tickle earned his 450SX Class career best seventh straight top-10 finish with a seventh place finish. This is a new 450SX Class record for him. Blake Baggett earned his ninth top-10 finish of the season with an eighth place finish. Andrew Short earned his eighth top-10 finish of the season. It was his 136th career 450SX Class start. Justin Brayton made his first start since the second race of the season and earned his first top-10 finish since race 13 of 2014. Trey Canard had a scary crash with Jake Weimer in Detroit. Will he be able to hold on to his second place standing in the Championship? The first 250SX Class race held in St. Louis was on April 27, 1996. Windham won on a Yamaha. This will be the 20th time the gate will drop for a 250SX Class race in St. Louis. 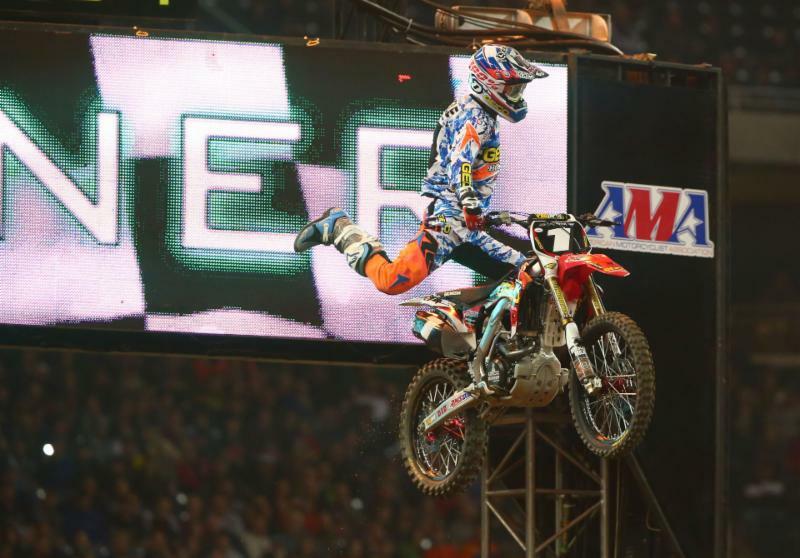 Honda won six in-a-row 250SX Class races in St. Louis from ''08-''13. There have been three first-time 250SX Class winners in St. Louis: Stephane Roncada in ''97, Ben Townley in ''07, and Blake Wharton in ''09. Justin Bogle earned his third career 250SX Class victory with his win in Detroit. It was his 15th career 250SX Class podium in 23 career 250SX Class starts. Bogle''s victory was Honda''s first 250SX Class win of the season. Bogle now sits 13 points behind Marvin Musquin in the Eastern Regional 250SX Class Championship Standings. The defending champion was able to earn his first victory of the season, so he has some late momentum. It will be hard to gain ground on Musquin, because Musquin hasn''t finished outside of the top-two all season. 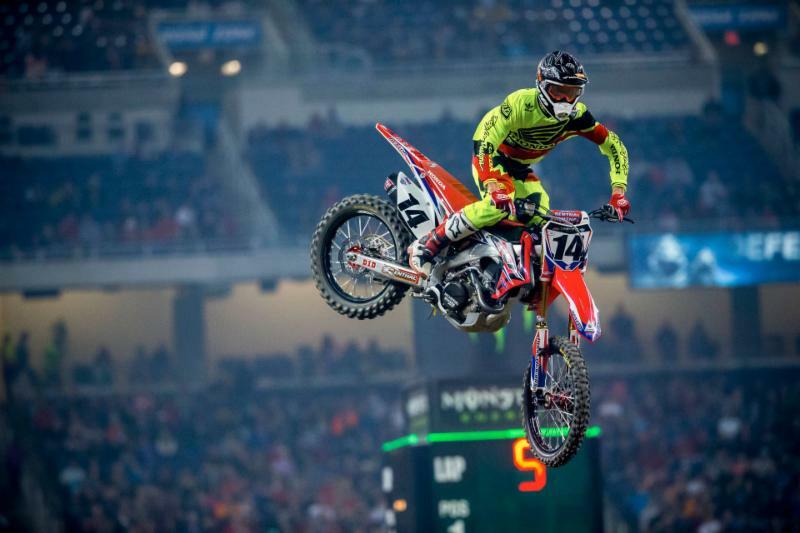 Musquin earned his 17th career 250SX Class podium with a second place finish in Detroit. He now has a first or second place finish in each Eastern Regional 250SX Class race this season. Musquin has 20 career 250SX Class top-five finishes in his 25 career 250SX Class starts. After winning three straight races, Musquin finally finished off the top spot with a second place in Detroit. Even with finishing inside the top-two in every race, his points lead is anything but comfortable. He will be looking to gain a larger advantage on Bogle, even if it''s just three points. Joey Savatgy rode his way to his second career 250SX Class podium with a third place finish in Detroit. He has 11 top-10 finishes in his 14 career 250SX Class starts. Savatgy is still looking for his first career 250SX Class victory and Pro-Circuit Kawasaki is still looking for their first win of the season. Can they kill two birds with one stone in St. Louis? Savatgy looked good riding to his second podium of the season in Detroit. Jeremy Martin earned his 12th career 250SX Class top-five finish with a fourth in Detroit. It was his 17th career 250SX Class start. Martin is still looking for his second victory of the season and is trying to gain some momentum for next season''s Championship. Anthony Rodriguez earned his first career 250SX Class top-five finish with a fifth place. It was his eighth career 250SX Class start. Colt Nichols earned a career-best sixth place finish, a week after his previously career-best eighth. It was his 2nd career 250SX Class top-10 finish in just five 250SX Class starts. Kyle Cunningham now has earned back-to-back top-10 finishes after his seventh place ride in Detroit. It was his 66th career 250SX Class start and 47th career 250SX Class top-10 finish. Mitchell Oldenburg, making his 20th career 250SX Class start, earned his seventh career 250SX Class top-10 finish with an eighth place. Jimmy Decotis rode to his fourth straight 250SX Class top-10 finish with a ninth place finish in Detroit. Decotis now has 21 250SX Class top-10 finishes in 34 career 250SX Class starts. Jace Owen, a week removed from his 250SX Class career best 10th place finish, repeated those results in Detroit. He now has two top-10 finishes in his eight career 250SX Class starts.